As we enter our “season” of regional contests, it’s a busy time for Australian barbershoppers. There will be Regional contests held in Sunshine, Central, Victorian, Eastern and Western Regions, held as qualifying contests for our National contest in September to be held at the Pan Pacific Convention in Sydney. A big vote of thanks to our judges and CA’s, and of course Chairman of Judges Alex Morris, for making this all happen so seamlessly. I had the honour to be a judge at the recent Central Region contest in Adelaide. The preparation and performance of the quartets and choruses was impressive! All groups were eager to receive feedback from judges, and successful workshops were also held, making it a fabulous weekend of barbershop for all involved. My view is that the whole build up to contest encourages your group to work harder, with some focus, and that’s a good thing. You can be motivated to rehearse and you have a goal. Successful people and teams have goals. They make practical and achievable plans to reach their goals. A great example of this happened last year when my chorus, Vocal Evolution, was planning its contest songs for Newcastle. We had chosen our songs earlier in the year and even performed them at International. Then, 3 weeks out from Newcastle we finally got word that the copyright permission for our up-tune had not been granted. It was a major setback and a crisis. Instead of complaining and whingeing about this (which we were probably entitled to do), we just accepted it and got straight into planning an alternative. We didn’t have another contest up-tune in our repertoire that we could just slot in. So our Music Team got mobilised. Lots of emails began flying about and lots of ideas. What could we do? A key point was that every comment was positive. Within 24 hours a plan had evolved. We’d use an up tempo song that we had been working on and make it a parody about copyright. It came together in about 2 days. Everyone contributed, some ideas were cast aside, no egos were involved, and we had our new contest song. We had the music ready to send to the guys on Friday and by Monday’s rehearsal everyone showed up knowing it. It was a triumph of planning, effort and coordination. This is a great example of how to positively approach a contest. That experience has drawn our chorus even closer together than we were. We all shared that adversity and we all stood up to it, and made a plan to conquer it. Next time your contest score is lower than you think it should have been, just think about making a plan to ensure that next time it will be higher. Get advice from the judges and execute a good plan. We’re all here to help you. If your group doesn’t go to contest I think you are missing out on a lot. Sure, you may not be able to afford or undertake the travel to National contest, but you can go along to your Regional contest and get just as much out of it. You can set some goals, learn some songs, learn more about barbershop, and share your love of our hobby with others in your Region. Give it a go! 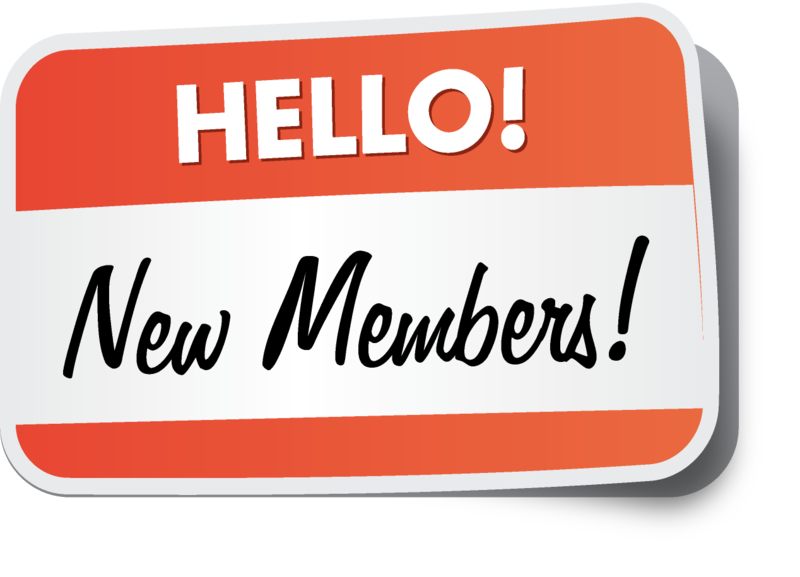 Our BHA Music VP, Andrew Howson, has assembled an impressive national education faculty (NEF), and it is Council’s plan to roll out educator visits to every Club and chorus during the next year. It won’t cost you anything except perhaps a billet of the coach for a night to so while they are visiting. Apart from that the NEF members are donating their time for free. Watch out for this new initiative, which has been a great success in the Sweet Adelines organisation. Youth members I’m sure are looking forward to the Deke Sharon workshops in Sydney in September with great anticipation. After all, Deke is world famous, and we’re so lucky to have him coming out to run two days of workshops in modern A Cappella singing. Deke is also a Life member of the Barbershop Harmony Society, so he knows barbershop too! BHA Secretary Trevor Rootes, and BHA Youth VP Kieran O’Dea are organising Deke’s visit, so if you have any questions please drop them a line. There is a huge amount of planning and effort going into the Pan Pacific Convention in Sydney, and I want to thank BHA Events VP Dan Millgate, and local organising coordinator Warren Lewis (and his team) for the fantastic effort they are putting in. When you see them in Sydney please make a special effort to thank them. Good luck in the coming contests to all, and I hope to see as many of you as possible in Sydney in September! 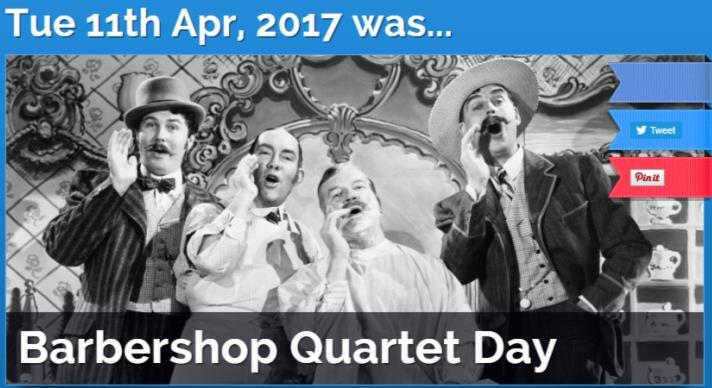 Tony Sykes from Sydney Harmony contributed to an online story about Barbershop Quartet Day which was published recently on the Australian news & opinion website The Big Smoke. It includes videos of quartets Signature and Ringmasters and Blindside gets a mention. It was a little before Christmas but still worth telling. A unique experience was in store for 30 members of the chorus. 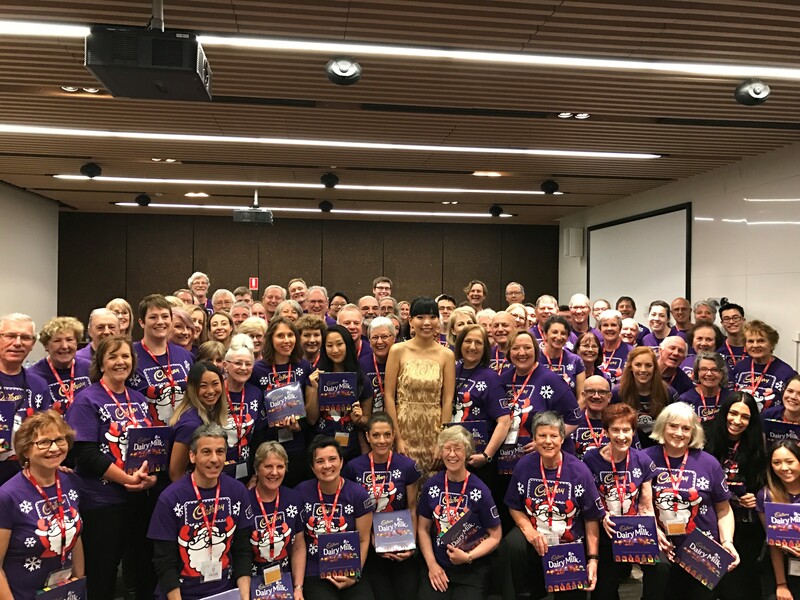 Those who were quickest off the mark were to sing with well known "The Voice" winner Dami Im, and return home with handfuls of Cadbury chocolates, so two attractions and two incentives to get into town at the unhealthy hour of 7.45am. 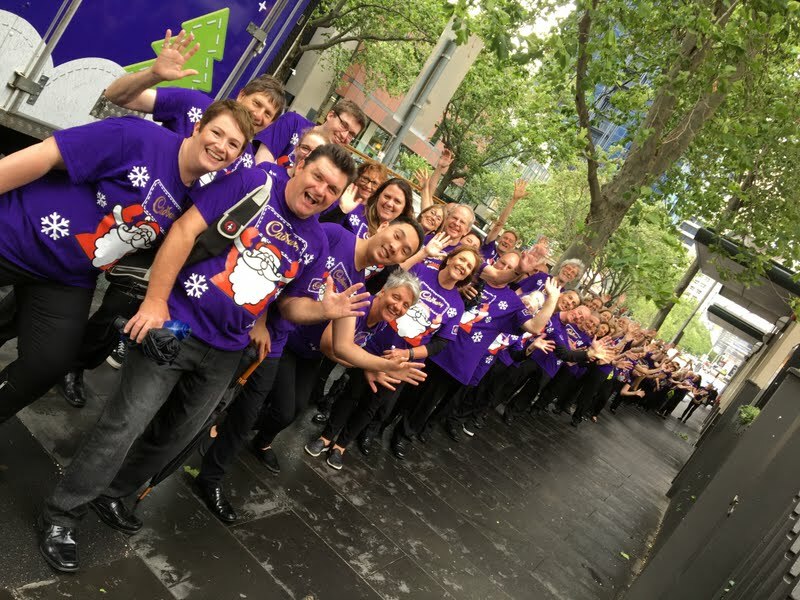 The original gig was for 80 singers to make a Cadbury advertisement, so apart from the Melbournaires, there were 30 members of the Melbourne Ladies Chorus, plus 20 others. These were all broken into selected octets and all took over the Origin Energy offices and sang with Dami in what turned out to be a news item rather than an ad. Then pairs of octets, dressed in their purple T-shirts, and struggling with the rain and boxes of chocolates for the staff of the businesses they were about to invade, made their way around Melbourne by taxi and tram. Heads turned in disbelief as the appropriately named choruses, Rudolph, Blitzen, Comet, Dasher, Donner and Prancer, were seen umbrella-less tramping through puddles, cuddling up to their chocolates, and quietly humming the three carols they had rehearsed so hard to perfect. Nothing if not resilient, the Melbournaires battled on, and with commiserations to those allergic to chocolate, returned home bedraggled and tired, but with booty in hand. The episode with Dami was shown on national TV news, so some exposure, and she was a delight to work with, and lit up an otherwise gloomy day in Melbourne. 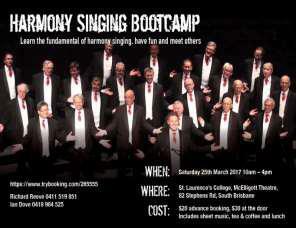 On the 25th March 2017, Richard Reeve with the assistance of David Reid from Sound Connection held a full day workshop in learning to sing harmony. The workshop was promoted through Facebook, Gumtree, local and Federal Politician’s websites and emails to various choirs and ensembles around Brisbane. 50 people attended the Boot camp. 30 women and 20 men spent the day learning the fundamentals of harmony singing. “I still Call Australia Home” was the song chosen. The day started on the basic concepts of posture and breathing and soon went in with the breakdown of parts, learning the individual parts thoroughly. After lunch, all delegates were confidently singing “I still Call Australia Home” in four part harmony. Pretty Boys might well be the riskiest thing we’ve ever attempted as an ensemble. 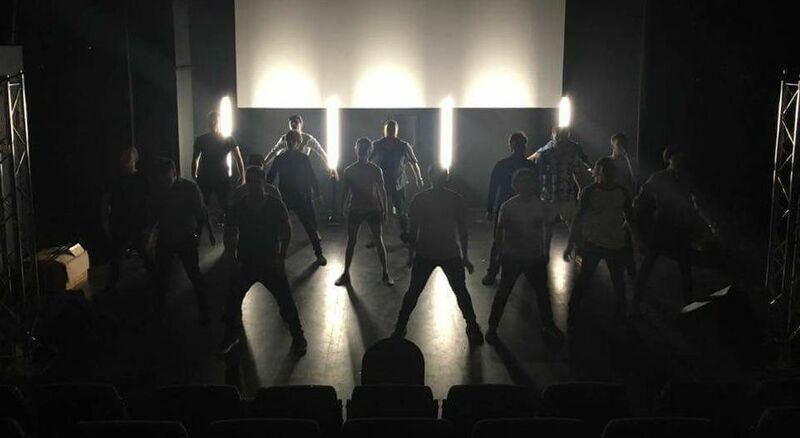 Getting 20 young men (many of whom had never acted before) to perform taxing choreography, make audiences laugh with their stage presence and line delivery and then sprint backstage to undergo some extremely quick costume changes just so they can turn around and do it all again is no mean feat, let alone asking them to keep it up for an hour. So many things could have gone wrong, and yet the results speak for themselves. 5 star reviews, a sold out season of 6 shows, around 1000 people through the door all cheering, laughing, whooping and giving standing ovations night after night. We are so proud of the show, the skills we were able to foster in our members, and the leadership shown by Mitre Khammash in directing the show, writing the screenplay, and all the organising work he put in behind the scenes. But there’s no rest for the wicked (as they say) and now we’re full swing into preparing for the next big thing for the Statesmen, and boy is it a doozey! We’re proud to announce that we’ve been invited to headline the Australian National Choral Association’s Choralfest 2017 and the Pemulwuy Male Voices Festival! We’re so psyched to head back to Brisbane for this in June and we’re keen to show these new audiences everything we’re capable of from barbershop to classical to contemporary. We’re pulling out all the stops in the lead up to this, bringing in guest coaches, commissioning some really exciting new works, and bringing all that we’ve learned to bear on putting a new spin on some old favourites as well. If you happen to be in Brisbane for the festival make sure you don’t miss out! 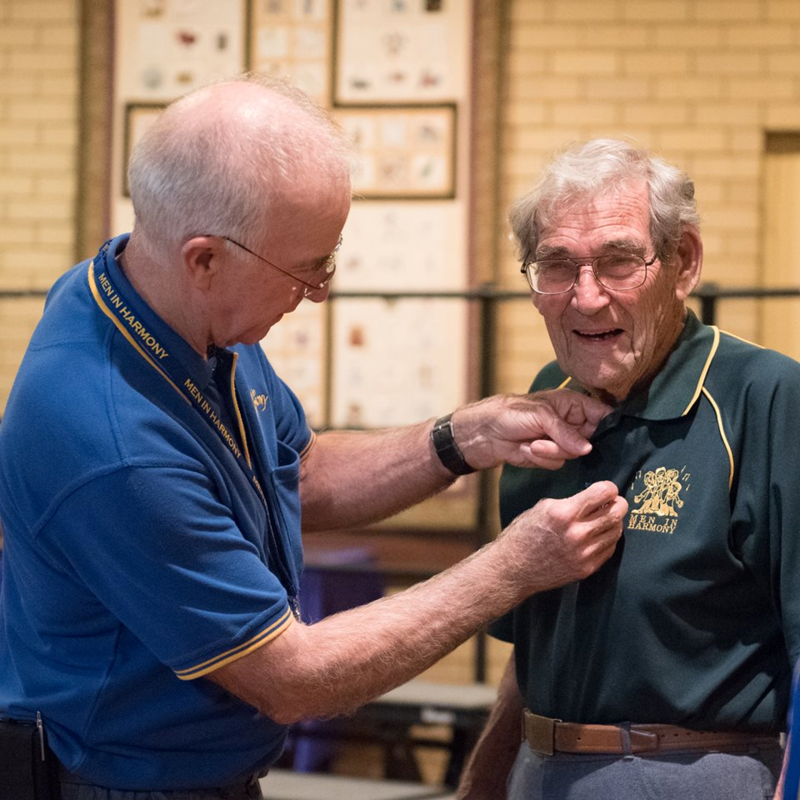 At Men in Harmony's recent AGM two stalwarts of our Chorus, Bruce Okely (L) and Vic Richards (R) were presented with their 30-year badges. 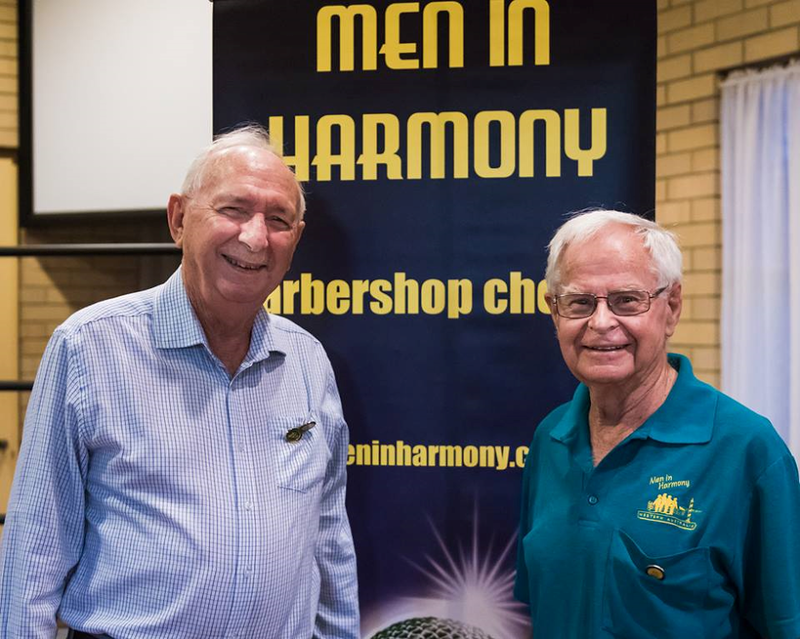 Commenting on Bruce and Vic's contributions over so many years newly elected President Ross Rhodes said, "Their efforts in starting and maintaining MIH, Australia's first barbershop chorus, cannot be overstated. Our hats are off to you both!" Andy Aberle, whose stature at MIH is the equal of Bruce and Vic, was unable to attend the AGM but was awarded his 30-year badge the following week. Here's President Ross awarding Andy his badge. At next week's rehearsal we look forward to presenting yet another 30-year badge, this time to former president Pat Knight (pictured), a loyal and committed member of our bass section over so many years. All four gents here are Life Members of our Chorus and recognition by way of their 30-year badges is richly deserved. Hobart Men’s Barbershop Harmony Club Inc.